I knew about the advocacy of exclusive breastfeeding even before I got pregnant. I may not have too much detailed information about it before but I support it. I know and decided for myself that once I got pregnant and gave birth to my own child, I will make sure to exclusively breastfeed him. Fast forward to my delivery date, I failed to start breastfeeding my baby because the hospital doesn’t support it, as well with unang yakap which is needed for new-born and new mommies. I only knew about the information that hospital should proactively let moms breastfeed their baby, days after I gave birth and upon reading more information on what to do. 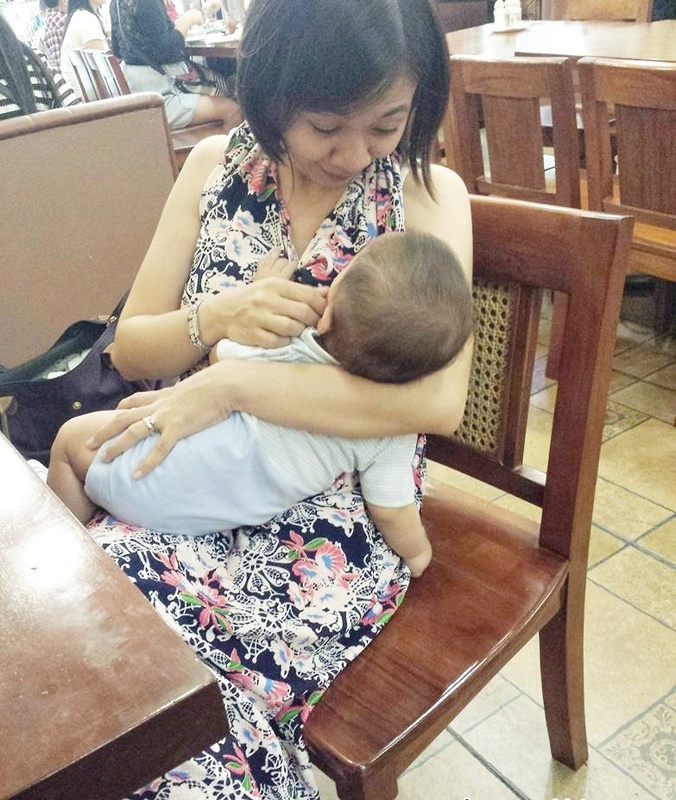 I was CS that time and while sleeping, the hospital asked my husband of things like feeding bottle, formula milk and other not-breastfeeding related essentials. Since I do not know about what is happening around me, I failed to start my exclusively breastfeeding journey because I lacked information. If I had only knew about it then. I wouldn’t have picked that hospital in the first place. After my days in the hospital, I ditched the formula and decided to stick with my original plan of doing it exclusively. Now I am proud to say that I strictly breastfed my baby after those days until now. My story wasn’t easy but I strive hard to make it happen. Despite the initial experience I had in feeding formula milk, I decided to start my exclusive breastfeeding journey on my baby’s 7th day. Back then, my baby had a vague case of CAH and an ambiguous genitalia so we had to bring him to Manila for all the lab works needed. With all the strength I had with me despite after the child birth pains, I braved the city with my husband Jaycee and my dad. Yes, I joined them because I want to be present at that time and I want to know what will happen during the initial process of lab works and all. My decision might sound crazy stupid because I just had an operation but being a mom, I am most concerned with my little boy as I have heard that CAH cases might put baby at risk in between 7-14 days. The worst case scenario for that is death. I might become even crazier if I am left at home. Since we were in Manila the whole day that time and we were rushing when we left, I didn’t bring his formula milk and water. That’s when I decided to totally banned off the formula and push on my breastfeeding journey. My husband only bought one box of milk and that’s the end of it. The first days were so painful that I actually had thoughts of stopping. I guess it was the first 2 days that I experienced it so bad that makes me want to stop. That’s why the formula milk feeding still went on for a few more days as what I mentioned earlier. But despite the difficult situation and the additional pain I had to bear, I still discovered the convenience of breastfeeding in so many ways. When my husband went back to work after his paternity leave, I am all left alone to attend to my baby’s needs and there are so many things that needs to be done. Breastfeeding is easier because I do not need to wash bottles, sterilize and use other things. It’s also easier to feed the baby at night because I don’t need to get out of the bed and prepare some milk. Baby’s 15 months now and breastfeeding him was easier than the first time. I already passed his biting stage. He bites very rarely so I totally rocked that stage without too much pain. Breastfeeding doesn’t require any special tool especially during the first few days. You just flip your blouse and offer the boobie to the baby and that’s it! All other equipment can be used if a mother decided to store milk when leaving the baby behind, like when the maternity leave is over and the mommy goes back to work. Just like what happened to my case. I will share a separate post on the preparation of storing milk and how to continuously do it. Galactagogues or those milk-boosting food and drinks aren’t really the reason why you have more milk. Yes, those may help to increase the body’s milk supply but the key to a higher supply is to LET BABY CONTINUE LATCHING. To establish more milk supply, the law of breastfeeding is like the law in economics. It is based on supply and demand. The more the baby latches on you, the more your body will signal to produce more milk supply. Don’t worry if at first try, there is low amount of milk. It is normal because the need of our baby is low too. The milk will adjust depending on how much milk the baby needs it. I am breastfeeding for 15 months now and I actually didn’t take any milk-boosting food or supplements. I tried, yes, but I feel that I have plenty of milk so I just stopped. I gave away my bottle of fenugreek to a milking mom who needs it more. It still depends though if you wish to add galactagogues in your breastfeeding journey. My baby is 15 months now and he is practicing Tamang KAIN (Kid and Infant Nutrition) proceeding to Baby Led Weaning. Will also share those two topics soon on the blog. Right now, I do not leave daily milk anymore if I go to work because solid food is where he gets his daily nutrients. I offer fruits and veggies and he likes to eat a lot. In cases that there’s a need of milk, be it my baby or someone else’s, I pumped and store again. I do that when baby has growth spurt or just extra fussy or teething. For donation cases, I need to let it know before-hand so that I can prepare. Just like what happened to an event few months ago where I joined the #MommyMilkShare event. I donated 50 oz. of milk. It was quite a rush because I only knew about it 6 days ahead. I will share about the story on that event soon. The key in maintaining more milk is based on how often the baby latches. Just continue offering the boobies to the baby and for sure, you will be blessed with continuous milk.